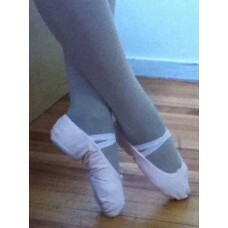 New, beautifully made split sole canvas ballet shoe, elastic drawstring and twin fitted arch elastic. Standard width. Great spare pair of ballet shoes. Washable. I do exchange PROVIDED the strings have NOT been pulled. Please include a pre-paid post bag with items as I can not carry the cost of postings with shoes at this low price. Please measure the foot for correct sizing.